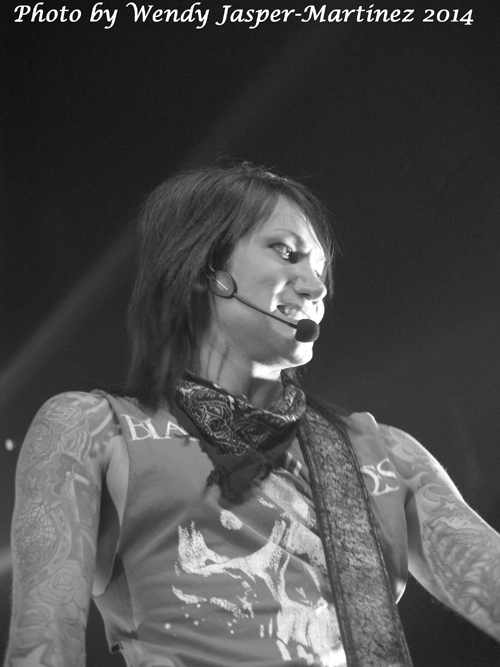 KNAC.COM - Reviews - BLACK VEIL BRIDES Live in Dallas, Texas With Pics! 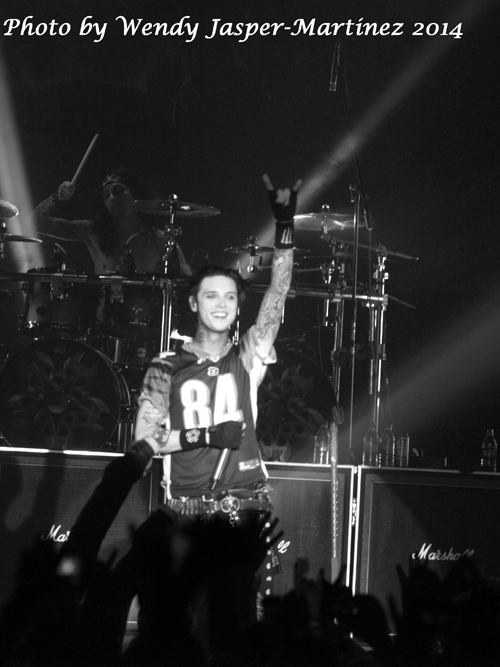 BLACK VEIL BRIDES Live in Dallas, Texas With Photos! Music is transcendent. It should take you somewhere, right? Songs should, and often do, have the power to transport you to another time, place, or life; and if they do, you are likely a fan forever. For the last couple of years, I have held steadfast in the belief that I have found the band that transports me back to the 1980’s and I will unashamedly bust out the Aqua-Net and eyeliner, don the band girly-Tee and squeeze myself into the front row every time they come to town. Yes, dear readers, I’m a 41-year-old BLACK VEIL BRIDES fangirl and I won’t even try to use the excuse that I’m taking my kid to the show. I’m there for me, and the first time I heard them, they transported me back to 1983; to when Vince Neil was shouting at the devil and KISS finally took off the make-up. I’ve had the pleasure of covering the band more than once and each time they don’t disappoint. Riding high on the crest of their latest release IV, the band rounded out the first leg of their U.S. tour with a stop at the Southside Ballroom on December 12th. The Bob Rock produced album debuted to much enthusiasm and has been voted Album of the Year by the Alternative Press. BVB opened the set with one of their new tunes, “Heart Of Fire” and as they took the stage the crowd was ecstatic. The Southside Ballroom is a mid-sized venue and it was packed to the gills for this band. Their fan base is loyal and extensive; many of the shows on the tour were sold out. “I Am Bulletproof”, “Coffin” and the new track “Faithless” were next on the set list and vocalist Andy Biersack never sounded better. He has the full package; energy, presence, vocal ability, and the look. He is music in motion and is a pleasure to watch and listen to. He interacts with the audience and gives them his all with every breath. Biersack owns the stage as he takes the audience back to songs from previous releases with “Wretched And Divine” and “Knives And Pens”. By this time, audience members are hyperventilating over the band that has spawned the BVB Army. However, don’t dismiss this band as fluff. The fluid team of guitarists Jake Pitts and Jeremy “Jinxx” Ferguson, and bassist Ashley Purdy is one to be reckoned with. Jinxx and his mid-show violin concerto “Overture” shows the creativity, skill and technical ability that rivals even your most fervent progressive power metal performances. “Shadows Die” is met with much fanfare and the group even does a comical cover of DANZIG’s “Mother” mid-set. As BVB moves into “Last Rites” and the ever popular “Rebel Love Song”, they prepare for a double bass attack of a drum solo. Drummer Christian “CC” Coma is a beast and his solo toward the end of the set gave the band a much needed breather. The crowd was electric and the fans were wild. As the band returned to provide us with “The Legacy”, “Sweet Blasphemy”, “Perfect Weapon” and “Fallen Angels” we turn our attention to the sad fact that the night is almost over. It’s bittersweet even though you know they will return for an encore that will blow you away. And they did. There is a reason that the encore, “In The End”, has been nominated for and won so many awards, including The Golden God for Song of the Year (2013). It’s just a good song. Written by Biersack for his late grandfather, it has everything you could want in a song; melody, meaning and strength. It tells a tale and makes you feel. 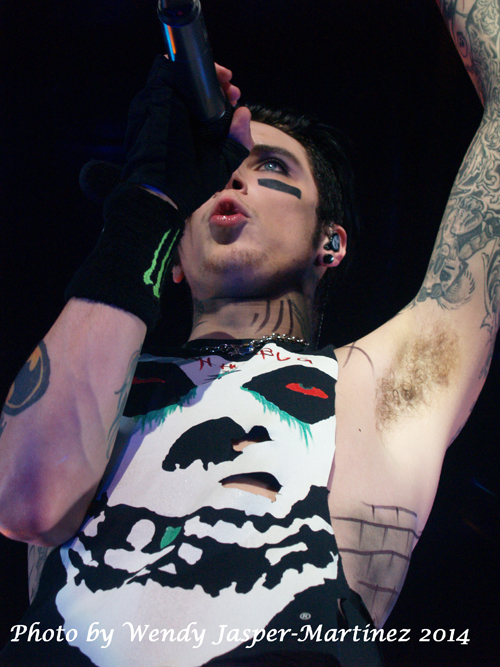 The crowd was screaming, girls were crying and everyone in the room was singing so loud that Biersack was almost drowned out in their enthusiasm. This is a show that leaves you drained but wanting more; and there will be more because the band is ramping up for shows through 2015 that includes another leg of the U.S., Europe and South America. As I wash off my eyeliner and try to figure out how to untangle all the Aqua-Net in my hair, I know that I hope they come back through Dallas sometime soon.